The wider Alfa Romeo Giulia range has been unveiled for the first time at the 2016 Geneva Motor Show. At launch, the powertrain range comprises four new engines: 200hp 2.0-litre turbo petrol; 150hp 2.2-litre turbo diesel; 180hp 2.2-litre turbo diesel engine and the range-topping 510hp 2.9-litre V6 BiTurbo petrol engine. Preliminary details of three trim levels - Giulia, Super and Quadrifoglio - have also been announced with final UK specifications to be confirmed at a later date. 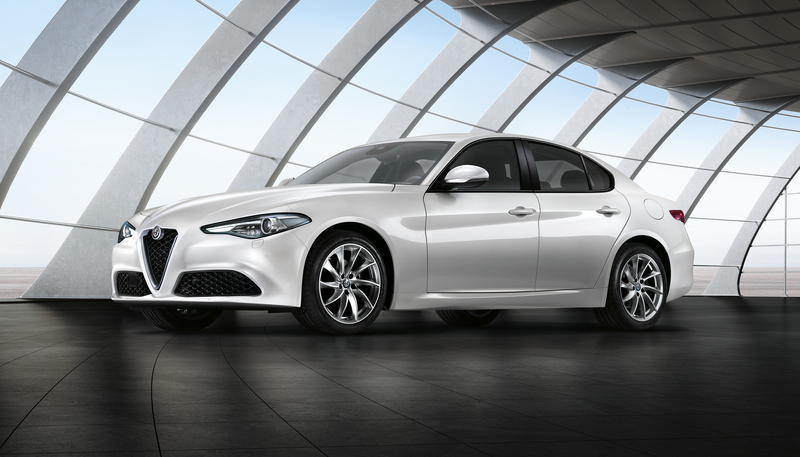 Developed by the best engineers, designers and stylists within FCA, the new Giulia embodies the core elements which have made Alfa Romeo one of the world's best-loved automotive brands: Distinctive Italian design; innovative powertrains, perfect weight distribution, unique technical solutions and the best weight-to-power ratio. 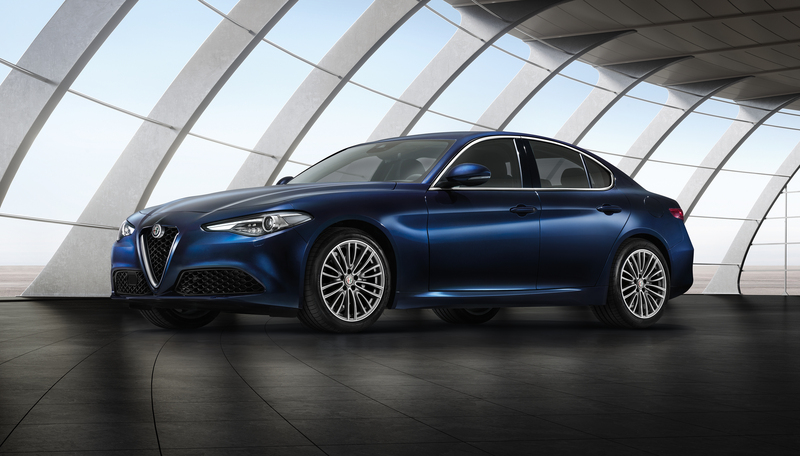 The taut proportions of the Giulia have evolved from its all-new rear-wheel drive architecture which bestows the car with short overhangs, a long bonnet, muscular haunches and the longest wheelbase in its segment. The Giulia benefits from the careful management of weights and materials to obtain perfect 50/50 weight distribution across its axles, while the sophisticated four-arm Alfa Link rear suspension (with an Alfa Romeo-patented solution for toe adjustment) and new double-wishbone front set up have been specifically tuned to maximise its dynamic abilities and enhance driving comfort. Also débuting on the Giulia is a new semi-virtual steering axis which optimises the filtering effect and guarantees rapid, accurate steering by keeping a constant caster trail in corners. In the Quadrifoglio version, the use of ultra-lightweight materials extends to other components including carbon fibre for the bonnet, roof, front splitter, rear spoiler and body inserts, as well as aluminium for the doors and wings. The braking system has been tweaked using aluminium elements, while carbon ceramic discs and seats with a carbon fibre structural frame can also be specified as options. With an dry weight of 1,524 kg, the power-to-weight ratio of the Quadrifoglio version is 335hp per tonne. Four all-new engines power the Alfa Romeo Giulia saloon, representing the newest and most advanced features available within the group, putting them at the top of their segment for performance and efficiency. All engines are manufactured in Italy at the Termoli (petrol engines) and Pratola Serra (diesel engines) factories, in areas designated exclusively for the construction of Alfa Romeo engines. This new, four-cylinder petrol engine is made entirely of aluminium and features MultiAir electro-hydraulic valve actuators, a 2-in-1 turbocharger and 200-bar direct injection, all of which translates into sharp throttle responsiveness as well as outstanding efficiency and low emissions. This engine produces 200hp at 5,000rpm and 330Nm of torque from 1,750rpm with official performance, economy and emissions figures to be announced closer to the Giulia’s international launch in the summer. This engine is the first diesel unit in Alfa Romeo’s history made entirely of aluminium. This four cylinder, turbo-diesel engine uses latest-generation MultiJet II injection system with Injection Rate Shaping (IRS), an operating pressure of 2,000 bar and a variable geometry turbocharger, while the balancing countershaft ensures smoothness and refinement across the rev range. Two versions will be available, one which produces 150hp at 4,000rpm and 380Nm at 1,500rpm, and the other with 180hp available at 3,750rpm and 450Nm at 1,750rpm. Exclusive to the Quadrifoglio version, this Ferrari-inspired, V6 BiTurbo petrol engine is constructed entirely of aluminium and delivers 510hp and 600Nm of torque, delivering a top speed of 190mph (307km/h) and a 0-62mph time of only 3.9 seconds. Remarkably, it is also best-in-class in terms of emission levels thanks in part to its electronically-controlled cylinder disabling system. Standard on all versions, this system automatically slows or brakes the car to avoid an imminent crash, using radar sensors and a camera to detect whether vehicles or obstacles, including pedestrians, are in its path. The system first warns the driver about the obstacle via an acoustic alarm and, if the driver fails to react quickly, it brakes autonomously to avoid collision. The Alfa Romeo Giulia is equipped with a new Alfa DNA selector, which modifies the car's dynamic behaviour according to the driver's selection: Dynamic, Natural, Advanced Efficiency (a new energy efficiency mode) and Race (only on Giulia Quadrifoglio). It adjust a multitude of settings, including those of the engine, suspension, steering, transmission, rear differential, instrument display, brakes and safety and driver aids, according to the mode selected by the driver. The range and breadth of adjustments vary depending on the engine and trim of the vehicle. A new eight speed automatic transmission makes its debut on the new Alfa Romeo Giulia, linked to the Alfa Romeo DNA (DNA Pro in Quadrifoglio) specifically tuned to deliver a comfortable and efficient-oriented drive when the car is in Natural and Advanced Efficiency mode, but still deliver exhilarating responsiveness and driver control when in Dynamic and Race (Quadrifoglio only) modes either when left in automatic mode or when the driver choses to shift manually via the selector or steering-wheel mounted paddle shifters. The cabin design of the new Alfa Romeo Giulia is every bit as crisp and clean as the exterior and, crucially, it is centred around the driver with the main controls grouped together on the small steering wheel. The human-machine interface consists of two simple, user-friendly knobs for adjusting the Alfa DNA selector and the infotainment system. Premium materials, including carbon fibre and real wood, are chosen for their visual and tactile pleasantness and assembled in such a way to make the human touch visible. Depending on the trim level, a 3.5-inch or seven-inch colour instrument display offers the driver all the essential information about the car at-a-glance. Organised in four screenshots, the information on display changes according to the DNA mode selected by the driver, offering a variety of readings including lateral acceleration, fuel consumption and suggested gear shift points. The new Giulia is available with the very best in terms of driving assistance currently on the market, including Forward Collision Warning (FCW), Autonomous Emergency Brake with pedestrian protection (AEB), Adaptive Cruise Control (optional), Lane Departure Warning and Blind-Spot Monitoring (optional). The Magneti Marelli-developed light clusters are equipped with halogen lamps or latest-generation Xenon technology with 25W or 35W modules, the latter of which is equipped with AFS (Adaptive Front-lighting System) to redirect the light beam while cornering and improve visibility. Standard equipment on the entry-level Giulia trim level includes 16-inch alloy wheels, daytime running lights, LED rear lamp clusters, dual-zone climate control, cruise control with speed limiter, 6.5-inch Alfa Connect system and the new Alfa DNA selector. In terms of safety features, Forward Collision Warning, Autonomous Emergency Brake with pedestrian detection, Integrated Braking System and Lane Departure Warning are all standard. The generous standard equipment on the Giulia trim level is supplemented on the Giulia Super by 17-inch alloy wheels, leather and fabric seats and special interior trim. Engines available in the Giulia and Giulia Super include the 200hp 2.0-litre turbo petrol, 150hp 2.2-litre turbo diesel and 180hp 2.2-litre turbo diesel. The top-of-the-range Giulia Quadrifoglio is equipped with the Ferrari-inspired 510hp 2.9-litre BiTurbo petrol engine and is easily identifiable thanks to its aerodynamic enhancements, 19-inch alloy wheels and 35W bi-Xenon headlights with AFS. Inside it is equipped with sports seats trimmed in leather and Alcantara, a sports steering wheel with red power button and the Alfa DNA Pro selector with Race mode. Performance enhancements also include uprated brakes, Active Aero Splitter, Chassis Domain Control and Torque Vectoring technology, while options include ultra-light carbon seats and carbon ceramic disc brakes. The new Alfa Romeo Giulia will go on sale in the UK in September with pricing and final UK specifications announced closer to the car’s launch. For images and more details about the new Alfa Romeo Giulia, visit www.alfaromeopress.co.uk and more information on the current Alfa Romeo range, please visit www.alfaromeo.co.uk.